One of my favorite movies is My Big Fat Greek Wedding. The key takeaways for me from the movie were that weddings are about tradition, bringing lots of family together and food. I guess that's what we have in common with the Greeks. The wedding was one of the most memorable events of my trip. It was filled with lots of laughs, relatives I haven't seen in years, rich and traditional South Indian food, glitzy clothing and jewelry, and best of all...I was a part of my cousin's important day. That's priceless!! Our trip wouldn't be complete without making a stop over in Delhi. I learned to speak Hindi here and still remember it to this day. There is so much to do and see, it's endless. In the past trips, we explored the historical landmarks such as Red Fort, India Gate, Rashtrapati Bhavan, Qutub Minar, Lotus Temple, Gandhi Museum and etc. This time we decided to take it easy and just have some downtime (which included shopping and spending time with friends). Delhi is one of the best places to go shopping (especially for clothes and trinkets). One of our best modes of transportation were autos; which also meant bargaining with the drivers for better fare pricing. Until one of our family friends told us about the Metro (subway). We used it to get to some of our destinations within the city and guess what, I loved every minute of it. It was fast, frequent, affordable and clean. It reminded me of my metro experiences in London and Paris. Its design is sleek and comfortable. My only concern is that with the ever growing number of people traveling by this mode, it's maintained well. Oh and nothing completes a day of shopping with some delicious grub. 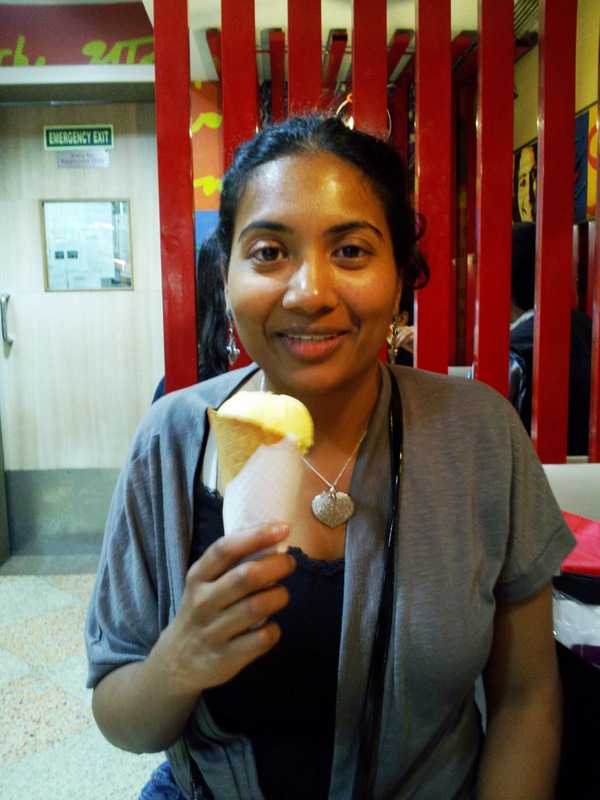 If we were living in India, street vendors and local restaurants would be our main source. As travelers, we dined only at restaurants we've gone to in the past and/or read reviews online. 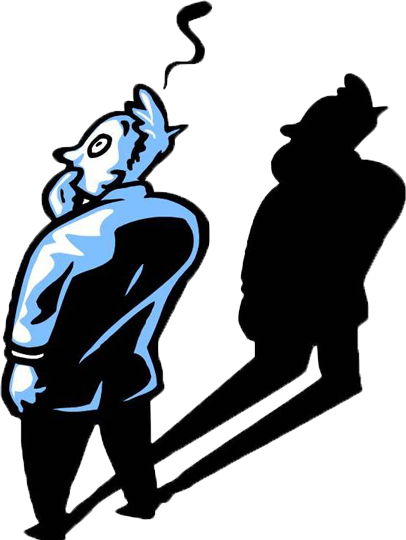 There's also some Western fast food joints such as McDonald's, Subway, KFC for worry-warts! It's better to be safe than sorry. You got to hand it to Haldiram's for presentation. Just look at the batura...it's so big. The paneer tikka as an appetizer was yum. Personally I found the bhel puri to be a bit spicy but I think it's because I'm a tourist now and not a local. Next time, I'll ask for more dahi (plain yogurt) and sweet tamarind sauce. Let's not forget the dessert which was served in little clay pots, also known as matkas. Aren't they so cute? I especially loved this place for its order retrieval. It was easy and way less wait time than in other restaurants. Our second favorite place to go is Nirula's. They have the best ice cream flavors and savory creations. That's the face of someone who just needed a cool treat and got one. By the way, Pineapple Pop was the flavor of the month and all those calories were totally worth it. 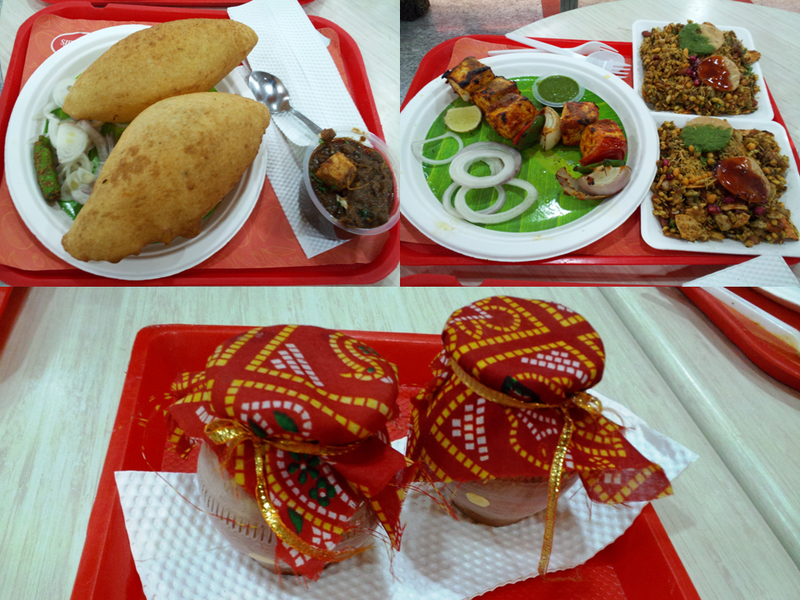 Next up is a little taste of the South...here we come Vijayawada and Hyderabad. There is nothing greater than undying love and devotion. One of India's most treasured monuments is Taj Mahal which was built by emperor Shah Jahan for his beloved empress Mumtaz Mahal. Mumtaz's final request for Shah Jahan was that he never remarry and prove his endless love for her by building a beautiful mausoleum. Shah Jahan also had plans of building a mausoleum for himself behind the Taj Mahal so that he may look upon his Mumtaz whenever he pleased. However, he passed away before it was completed and only the foundation remained. He was later buried next to his empress inside Taj Mahal. The story was so beautiful that I couldn't help but cry while our guide was telling it. The best time to visit the Taj Mahal is during the winter months and go early. One time, we made the mistake of going in the summer and suffered...it turned out to be the hottest day of the year. Let's just say I lost a weight on that trip and it wasn't intentional. This time, we got to the monument early in the morning (around 7ish) and enjoyed the view without the crowds and hassle. If you are planning to hire a guide, make sure they know more than what's written in the guide books. We walked around the grounds a while just taking in the ambiance and also explored the other structures around the Taj; such as the mosque on the left and Mihman Khana on the right. The Mihman Khana was used as a guesthouse during the death anniversaries of Mumtaz Mahal and then as a banquet hall by Indian princes and high ranking British officials during the 18th and 19th centuries. It was difficult to leave the Taj Mahal but we had one more monument to see in Agra called Fatehpur Sikri. It was the former imperial capital of Mughal emperor Akbar. 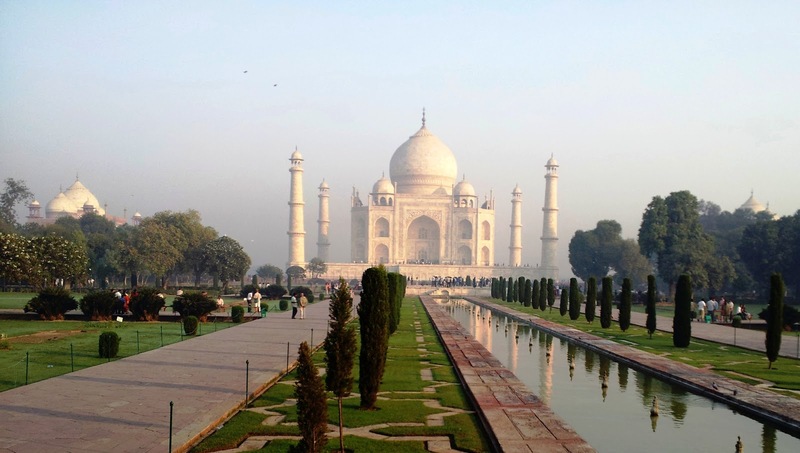 Just like the Taj Mahal, the city was constructed with influences of Indian, Persian and Islam traditions. The album below is from our tour through Fatehpur Sikri. 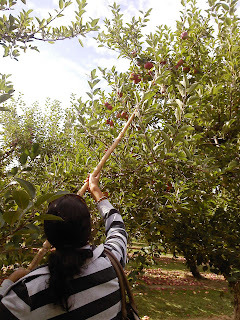 If we had more time, we would have stopped by Agra Fort too but we had to get packing and drive to Delhi that day. However, it was a great day filled with lots of picturesque memories of India's national treasures. 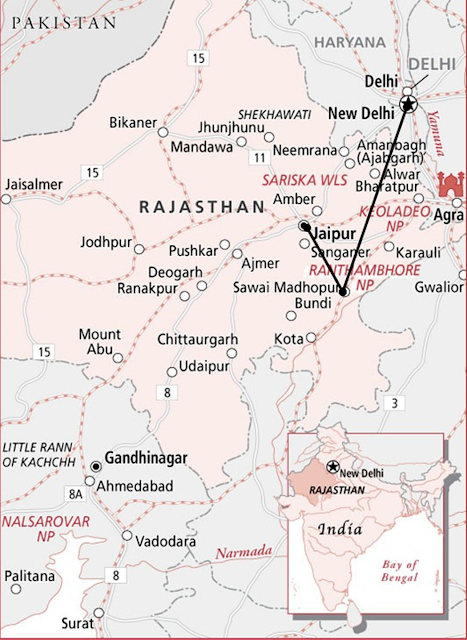 We left the evening of the seventh and arrived in Jaipur on the morning of the ninth. After a long flight all we wanted to do was to sleep off the jet lag. However, it was tough to sleep with all the excitement in the air. Did you know that Jaipur is also known as the Pink City of Rajasthan? In 1876, the city was painted pink to welcome Prince Albert and Queen Elizabeth II and since then the nickname remained. The city is full of rich culture, food and magnificent architecture (such as palaces, forts, and lush gardens). It's easy to work up an appetite after all the sightseeing and exploration of a new city. We asked around and received some suggestions for quality restaurants that serve tasty Rajasthani cuisine without pinching the pockets too much. The cuisine is rich and simple. During the few days we spent in the city, we enjoyed freshly made breads such as naan and parathas with rich vegetable curries. The best part of Jaipur for me was Choki Dhani. It is a re-creation of an authentic Rajasthani village filled with entertainment for the whole family, crafts & trinkets shops, and an unique dining experience. Words are not enough to describe the food we ate that night. Inside this large clay built hall, there were men dressed in Rajasthani garb serving everyone various types of appetizers, breads, curries, and sweets. 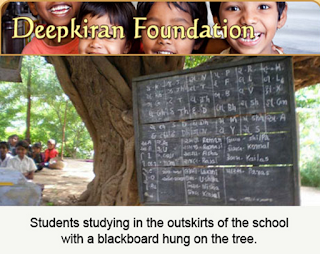 Pictures are included in the album. The enthusiasm was building up as we headed to the next stop which was the Ranthambore National Park & Tiger Reserve. We stayed in town for two days while we explored the park and all its treasures. Our accommodations were at this hotel called Vatika Resort; it was a short distance from the reserve. It has eight cottages with comfortable beds, bathrooms and flat screen TVs. There was no need to worry about the quality of the food because all meals were prepared fresh each day of our stay. Also, we made all our bookings through a trusted travel agent who we used in the past. They booked two safaris (evening and morning), increasing the odds of us spotting the tigers. Our evening safari was the best one out of the two and to top it all off, we actually saw one of the biggest male Bengal tigers on the reserve. How lucky were we!!! We left Ranthambore with great delight and headed for our next adventure in the North...to Agra and Delhi! - There are eight zones or trails around the park where the safari guides are allowed to take passengers. Before planning your trip, we recommend calling the park or your booking agent ahead of time to secure a seat and to inquire about the best zones where more wildlife was sighted so you can try to avoid disappointment. Also if you are going on multiple safaris, make sure that the zones aren't repeated if one of them had no action. - Depending on when you plan to go to Rajasthan, here are other cities to explore: Udaipur, Jodhpur, Jaiselmer, and Bikaner. Also look into going to the Pushkar Camel Fair. Time to get all the ingredients together with Thanksgiving just around the corner. One of the most popular recipes, besides the Turkey, is the stuffing. The traditional way is making it from scratch or you can just buy the pre-made variety. Since we don't eat Turkey, that's not something we worry about. However, when we host the big dinner, we serve up some of the traditional dishes. Instead of Turkey, we usually make biryani or something hearty like koftas. Last year, we incorporated the stuffing by dressing it up a bit and making a dish out it...desi style. Have you ever heard of Stuffing Upma? You may have heard of stuffing and upma* separately, but have you heard of them together as one dish? We didn't think so and that is why you are seeing it now...in time for Thanksgiving. Serve up something new as part of the dinner or for the morning after. This recipe makes 4 to 6 servings. 1) Start off with preparing the seasoning for the dish by heating oil in a saucepan and adding cumin and mustard seeds. When they start to splatter, add cashews and fry them until golden. Then add onions, green chilies, ginger and saute until onions are caramelized. 2) Then add tomatoes and beans and stir until the tomatoes are cooked. Next add water as per the measurements on the stuffing packet. Add salt, peas and carrots, and then allow the water to come to a boil, reduce the heat and mix in the stuffing quickly. 3) Stir until the vegetables and stuffing are mixed well and water is completely absorbed. Close the lid and cook for 2 to 3 minutes. Hint: For flavor enhancement, mix in a tbsp of butter and serve hot. Upma is a popular South Indian breakfast item made with semolina, variety of vegetables, and spices. Love Milk? 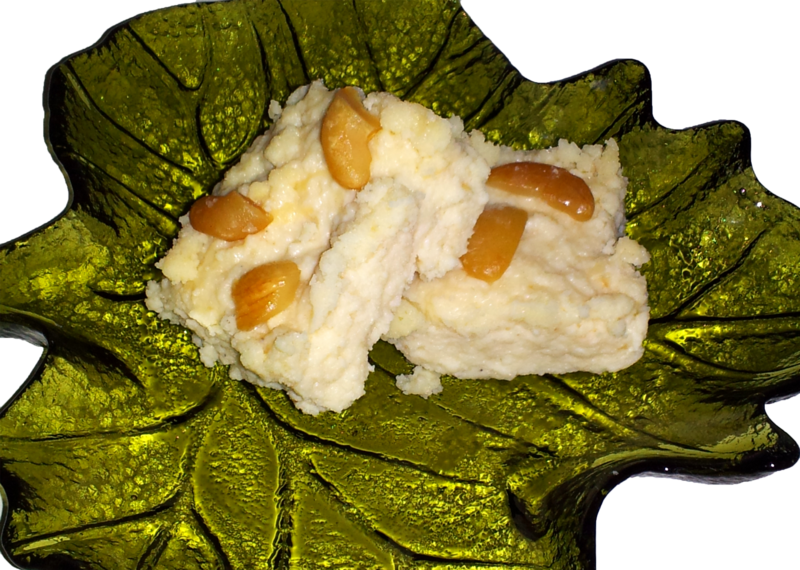 Then you must try this North Indian dessert called Kalakand; which is also known as Milk Sweet. It's really easy to make and fun to eat like brownies. Ooooh, just thinking about it is making me hungry. Procedure: Mix evaporated milk powder and ricotta cheese together until all the liquid is absorbed. In a non-stick pan melt 3 tablespoons of butter and fry the ricotta cheese mixture for ten minutes. Add condensed milk into the cheese and keep mixing regularly to avoid the mixture sticking to the bottom. Allow the mixture to cook for 20-25 minutes or until it comes together. Now add the cardamom powder and mix well. Transfer the mixture into a dinner plate or a cookie sheet and spread evenly. In a small pan, heat one tablespoon of butter and evenly roast the nuts until golden brown. Remove from butter and gently press them onto the neatly pressed mixture in the dish. Allow the mixture to cool in the refrigerator or keep outside at room temperature and then cut it into squares. This recipe makes 24 squares. ***Quick Tip: Roohafza or Rose water can be used instead of cardamom powder to give a mild rose flavor to the sweet. Wow, what an interesting week we had! We were like thousands of residents in the Northeast who lost power due to the early snowstorm that left a path of destruction behind it. A lot of trees, branches, and power lines were down due to the weight of the snow, making it harder for the plow trucks to clear the area. It was all a big mess. On top of it all, we didn't get to celebrate Diwali the way we planned. Instead we spent it shoveling the driveway and packing all our food into ice boxes. Luckily we had a gas stove and were able to heat up the food and not worry about wastage. So what did we eat during this whole week? I realized how much we relied on electricity for our everyday cooking. We used the microwave to heat up frozen vegetables for our curries or to speed up cooking time. Even something as simple as making rice turned into a project since we couldn't use our rice cooker. We made it over stove top by candlelight; watching over it to make sure it didn't burn. It was a good learning experience. We also made payasm (Vermicelli Pudding), pav bhaji (mixed vegetable curry served with bread), and simple vegetable curries which can be rolled up in rotis like Kati Rolls. Update: Power was restored last night and keeping my fingers crossed that we don't lose it again. It was a hell of a week with no heating and light. We went to bed early praying, we would wake up in the morning realizing it was all a nightmare. Our heart goes out to all those who still have no power. Be strong!! Sambhar is a type of vegetable stew or soup that has its roots from South India. 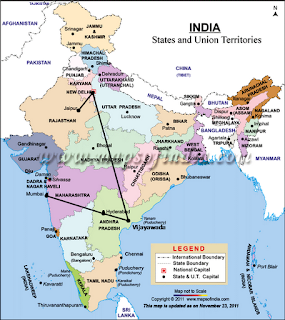 Every South Indian state has its own variation. Our version of sambhar hails from Andhra Pradesh (my home state) . Now the base of soups or stews starts off with the broth or stock, and then you combine it with meat, legumes or vegetables. The broth in Sambhar is usually made with tamarind and/or pigeon peas and cooked with vegetables. The type of vegetables range from carrots, pearl onions, eggplant, tomato, sweet potato and/or okra with a blend of various spices (Sambhar powder can be found at most Indian stores). We love cooking with seasonal produce whenever we have the chance. On our recent trips to the lcoal market, we bought pumpkin. Here are some great ways to enjoy this chunky dish: In a bowl with pieces of toasted bread; mixed with hot rice and a touch of ghee or clarified butter; or dip your favorite dosa or idlis. This dish is an explosion of sour, spicy, and sweet flavors. Let's begin making this dish, shall we? 2) Soak the tamarind in 1 cup of warm water for at least 15-20 min and later squeeze the juice out using at least 1 liter of water. Transfer the juice into a soup pot or large saucepan and add the pumpkin pieces, chili powder, turmeric, brown sugar, fenugreek powder and salt. 3) When the pumpkin is cooked and liquid is boiling, mix the besan/flour in ½ cup of water and add to the broth stirring continuously. Cook for 2 to 3 minutes until the broth thickens and remove from heat and keep aside. 4) Prepare the seasoning (listed above) for soup in hot oil. - Pigeon peas are added to the preparation of the broth to thicken and reduce the sourness of the dish. Besan/flour and pumpkin help in thickening the dish and reduce the sourness taste. - Check out Cooking 101 for tips on preparing the seasoning or click here to watch the video. - Sambhar Powder can be substituted for the following ingredients: Hing, Fenugreek powder, and Chili powder. Did you know: How closely related sambhar and gumbo really are? 1) They both fall within the same category of soups and stews, 2) have a strongly flavored stock, 3) combined with lots of vegetables to create this thick dish, and finally 4) are traditionally served over rice. I know you want one or two; or maybe the whole plate! We've heard a lot from our readers that they like multipurpose ingredients. We agree with that too. No one wants to buy uni-purpose ingredients that aren't affordable. With that in mind, we looked into our spice rack and cupboard to see what sweets to make for Diwali that everyone can make. After chatting up my infamous aunt, we decided on making Poha Laddu. She said it was really easy to make and required minimum ingredients; that works for us. Just a recap, Poha is another name given for flattened rice. There are two kinds of poha: thick and thin. It is important to choose the right one when cooking with it as results vary. 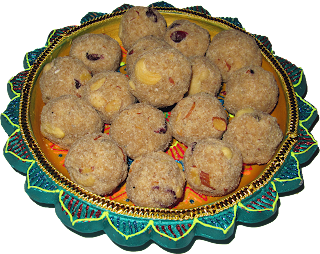 It can be used to make dishes like Garden Poha or mixture (Indian snack). Let's begin making our sweet as we have lots to show you. This recipe makes twenty to twenty-two lime-sized balls. Melt butter in a pan and add all the nuts and raisins. Toast them lightly, remove from butter and set aside. Then add poha into the butter and fry on a reduced flame until it is well roasted. Transfer it to a plate and let it cool. Powder the poha, sugar and coconut separately in a blender. Transfer all the powders into a mixing bowl including cardamom powder and mix well. 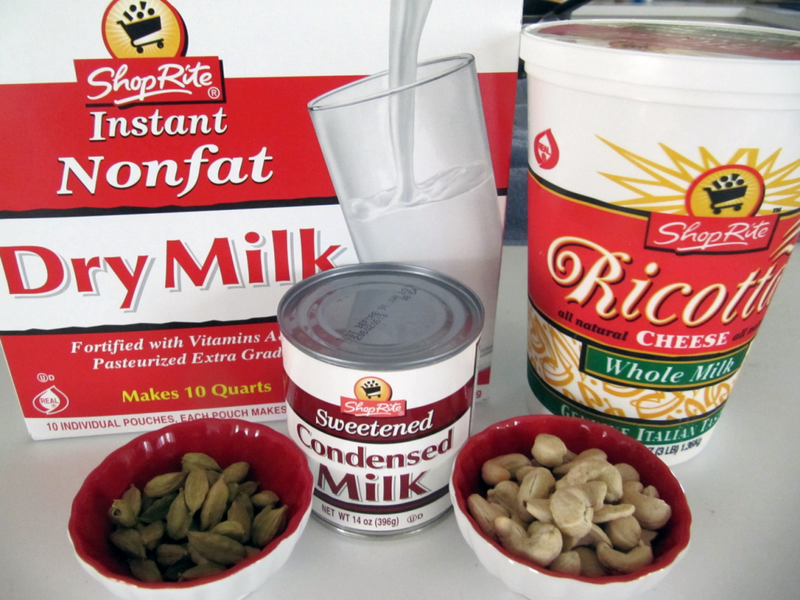 Add evaporated milk and take portions of the mixture and roll into a ball. Finally take nuts and raisins and press them gently into the ball. Arrange them on a tray and let them dry before serving. - For a longer shelf life, use melted butter instead of evaporated milk. - You can use fresh coconut, if grated coconut is not available. This goes out to all the Heat Seekers!! I think every family has a network of culinary experts. I know it's true in my own family. One of my aunts is an expert in making spicy curries. Her husband has a high tolerance for spicy dishes. I boast about his tolerance to all my friends. So for this year's Diwali celebration, my mom and I decided to add a spicy dish to the menu. And who better to consult, than my aunt. When I was inquiring about her dishes, she said, "Are you sure you want those recipes?" After some persuasion, she came around to it and sent us the recipe for Stuffed Jalapeno Curry. How to prepare the peppers for the stuffing (Gloves may be useful when handling the peppers): Wash and dry 7-8 peppers thoroughly. Slit each pepper with stalk end intact. 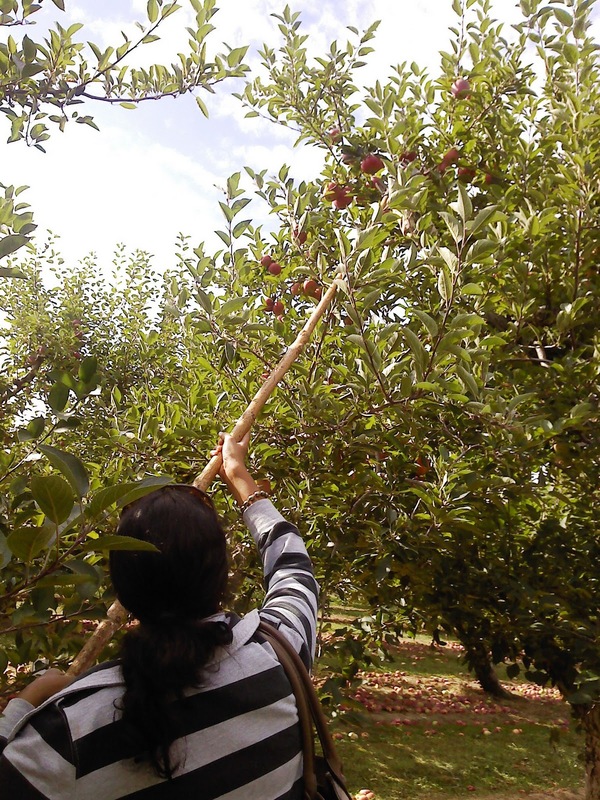 Carefully pry it open and with the handle of the spoon, scrape out the seeds. This step depends on your spice tolerance. If you are a Hot Head, then leave some in there. However, let it be stated that, We Warned You. Then apply salt to the inner surface of each pepper. Once all of them have been prepped, please keep aside. 1) Heat one tablespoon of oil in a pan, add the chopped onion and stir fry for a few minutes. Then take it off heat and put aside for cooling. 2) Blend the following ingredients together: dry coconut powder, stir fried onions, coriander/cilantro, and roasted cumin powder. Pulse the mixture for 3-4 minutes, but do not over grind. Adjust the salt as per your taste. Then stuff the peppers with the mixture and put aside for frying. 5) Saute the peppers until they have a brownish tint and are cooked thoroughly. - This curry can be enjoyed on its own or with some hot rice (plain or brown) or quinoa. 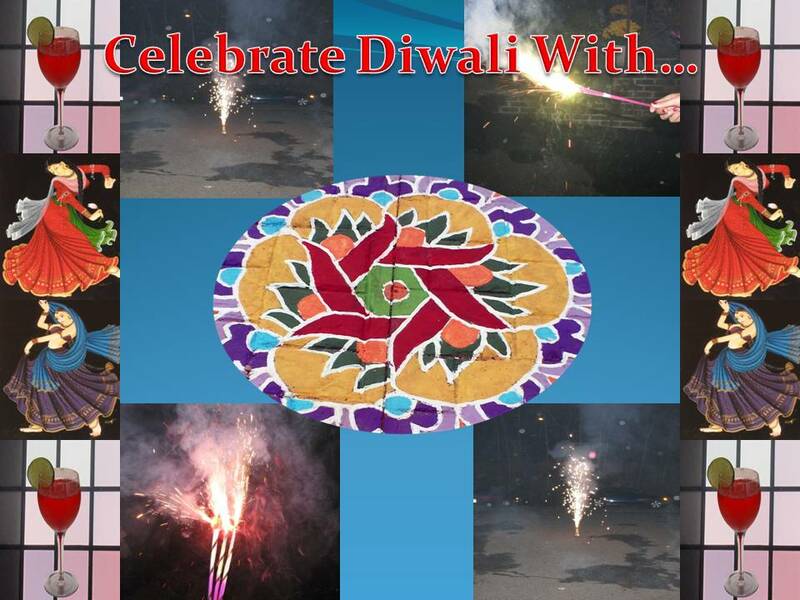 Family and friends, festive dishes, drinks, music, rangoli, and fireworks!! Since Diwali falls midweek, we will have a small celebration during the week and a grand one over the weekend. We chose an intricate rangoli design to be drawn on the festival day and prepared some dishes such as Stuffed Jalapeno Curry, Powdery Poha Laddus, and Kalakand. What a nice spread of gourds we have here! Can you name them all? 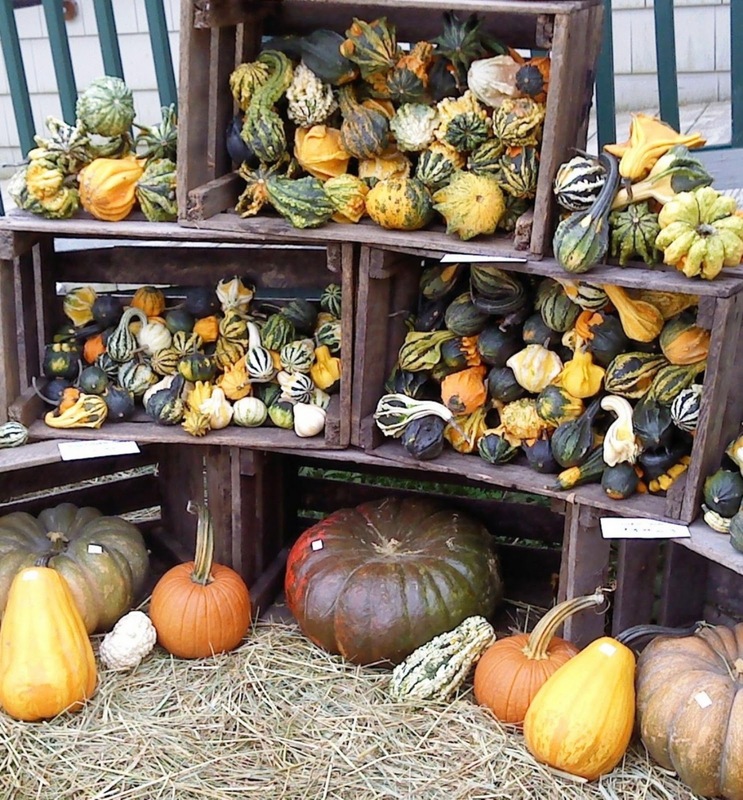 There are pumpkins, butternut squash, acorn squash, sweet dumpling squash and lots of other ornamental gourds. We were passing by this farmer's market and decided to pick up a few to make our fall dishes. We love cooking with these sweet and savory gourds because when they are cooked, they retain their beautiful color and flavor. Our two favorite dishes are Seasoned Pumpkin and Butternut Squash Curry and Chunky Pumpkin Sambhar. This curry is popular both in North and South India and most people eat it with hot rice or roti (also known as chappati). This dish can also be served as the vegetable side dish with your meal. It is enough for 4-6 servings. 1) If the pumpkin and butternut squash are thick and woody, remove the seeds and peel the skin. Cut them into ½ inch pieces. 2) Heat oil in a pan and add cumin and mustard seeds. When they start to splatter, add cumin/coriander powder, chilies, ginger and turmeric. Stir and then add pumpkin and butternut squash pieces, salt, and brown sugar. Mix well and cook the pumpkin with closed lid for 8-10 minutes or until it is cooked and firm. 3) Stir the vegetable mixture in between, allowing the condensed water from the lid to fall into the curry for moisture. 4) When it is done, add carrots & peas and coconut powder and cook under closed lid for 2-3 minutes. Once that is done, garnish it with chopped coriander. - Spanish Pumpkin is also known as Calabaza or West Indian Pumpkin. It is available in most grocery and ethnic stores. - The measurements of butternut squash and pumpkin can be adjusted as per availability. Have we got a treat for you! Today's recipe highlights two ingredients that are quite different from each other, both in taste and texture. One is an herb used as a garnish in many Indian dishes and the other is used to make America's famous apple pie. You guessed it, coriander and Granny Smith apples. These two ingredients are combined to make one sweet and tangy flavored sauce which we like to call Green Apple Salsa. It's great for dipping your favorite chips. Ours is hearty pita chips. Put all the ingredients except for the peanut butter and grind to a coarse texture. Now add the peanut butter and blend again to mix well. Taste to check the salt and adjust if needed. ***Quick Tip: It can also be used as a spread on finger sandwiches instead of mint chutney. Put on your thinking caps and get those creative juices flowing for this special opportunity! Rangoli is truly a work of art. It is drawn on all Hindu festivals and weddings all over the world, as it is thought to bring good luck. The designs are usually of flowers, simple geometric shapes, religious symbols, intricate patterns or a combination of all of the above. My grandmother once told me that my mom used to win prizes for her unique designs in all the rangoli competitions. Hopefully, one day I can impress her with mine. The material used to create these patterns is dry or wet granulated rice flour (white) and by mixing colors such as vermilion, turmeric, and other natural ingredients. These days, chemical colors are combined to produce more variety of choices. As colored powders are not readily available, we use colored chalk to create these beautiful works of art. This year, we decided to open up the floor and request our readers to share their rangoli designs with us. 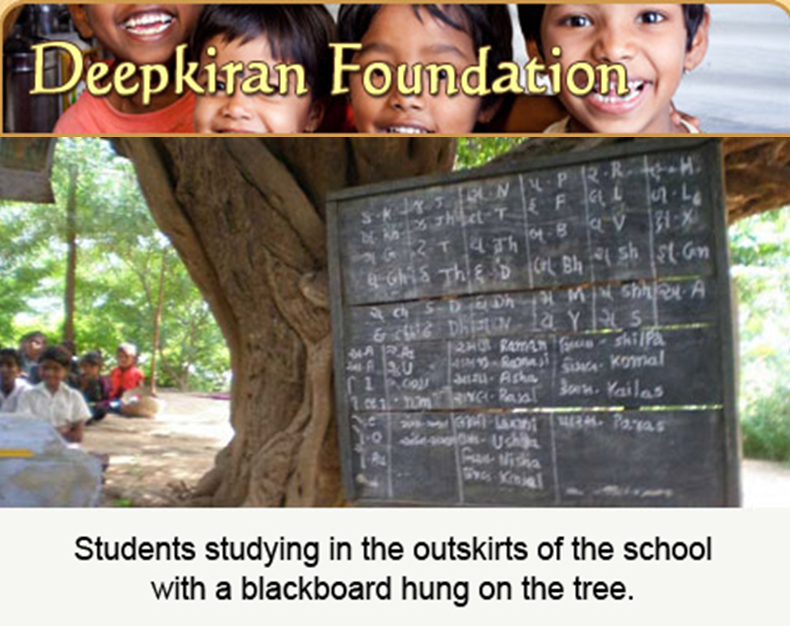 Please send your ideas to Jahnavi at: IKME2010@gmail.com. All entries must be in by October 22, 2011. We will select one from the submissions, showcase it on the day of the festival and on our Facebook Fan Page for everyone's viewing pleasure. Feel free to use the same email address to send us questions about the CONTEST. Our heart goes out to all the families that were affected by Hurricane Irene. We hope that in time all will settle down and life will go on. 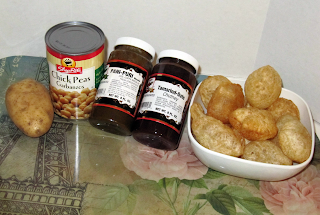 We weren't sure how we would be affected by the storm, so we kept cooking to a minimum and munched on snacks. One of my favorites is Pani Puri. 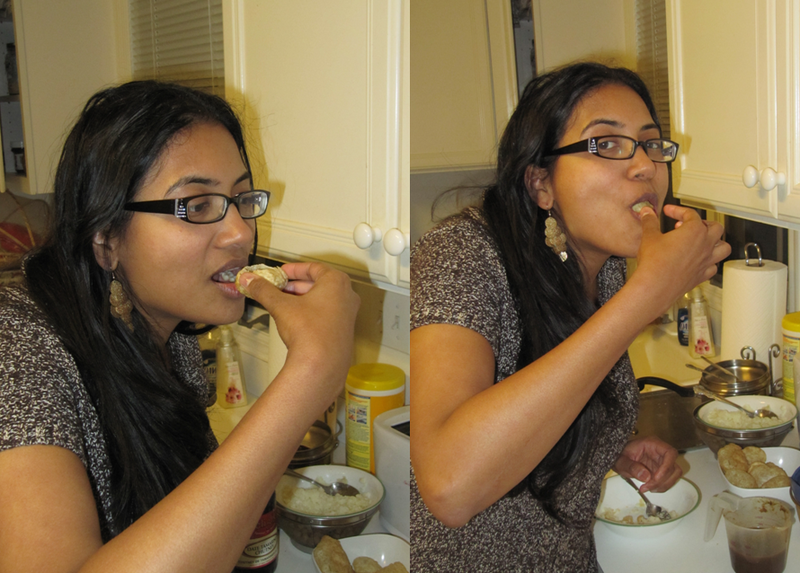 I love pani puri because it's easy to assemble and fun to eat. You know the Pringles jingle, “Once you pop, you can't stop”. That's how I feel about this snack too! 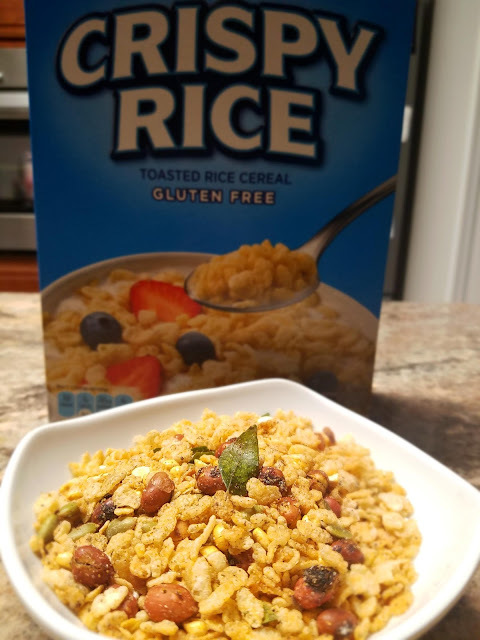 It’s so delicious and because it’s a light but filling snack made with healthful, all natural ingredients. You can eat loads at a time without feeling guilty. 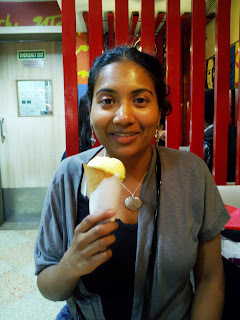 Also did you know, Pani Puri is an inexpensive and popular snack found all over India? So have a puri, or two or three and be MERRY! Procedure: Microwave the potato for 2 to 3 minutes or until thoroughly cooked. Drain and wash the chickpeas. Then mash the potato and chickpeas together to a granulated mixture. Next, dilute the pani puri masala with water to your desired tangy taste (tamarind-date chutney may be mixed in for a bit of sweetness). Now you are ready to enjoy the pani puris. Insert a hole into the puri without breaking through it completely. The Puri never had a chance! Then scoop a bit of the potato and chickpea mixture into the puri and fill it up with the pani puri masala liquid (also known the "pani"). Next, quickly put the whole puri inside your mouth and crunch away. Hint: Don't eat the puri in two bites because all the stuffing will fall apart and you'll create a mess. Make sure to eat the puri in one go (as illustrated above). - Alternately if pani puri masala is not available, the combination of tamarind and coriander chutneys and diluted plain yogurt can be used. - For a more tangy or chatpata taste, sprinkle chat masala over the potato and chickpea mixture. With all the wet weather we've been having, my mood has been taking a big hit. I should be thankful to Mother Nature for gracing us with so much rain but enough is enough. We've seen more rain than sun these past couple of weeks. Anyways, I didn't let this weather get me down, NO SIR!! My mom bought this tea on my aunt's recommendation and this afternoon was the perfect time to try it out. Hot Tea + Wet Weather = Perfect for Relaxed and Refreshed Mood! It's the perfect blend of cardamom and black tea to awaken the senses. I like drinking my tea without milk, so with each sip I was engulfed with so much aroma and flavor that I forgot where I was. I started reminiscing about my trip to Kerala where I was surrounded by hills covered in tea plantations and woke up every morning with the sweet aroma of tea. It was the perfect start to the day and set the mood for an enjoyable time. Then I was back in my arm chair finishing the last drop of my tea. Alas, it was nice while it lasted, I will cherish these few moments of Zen. Quick Tips: This tea is available at most Indian stores; I bought mine at the local Indian grocer. We wanted to take this opportunity to clear up some confusion about a certain vegetable that gets mispronounced a lot. 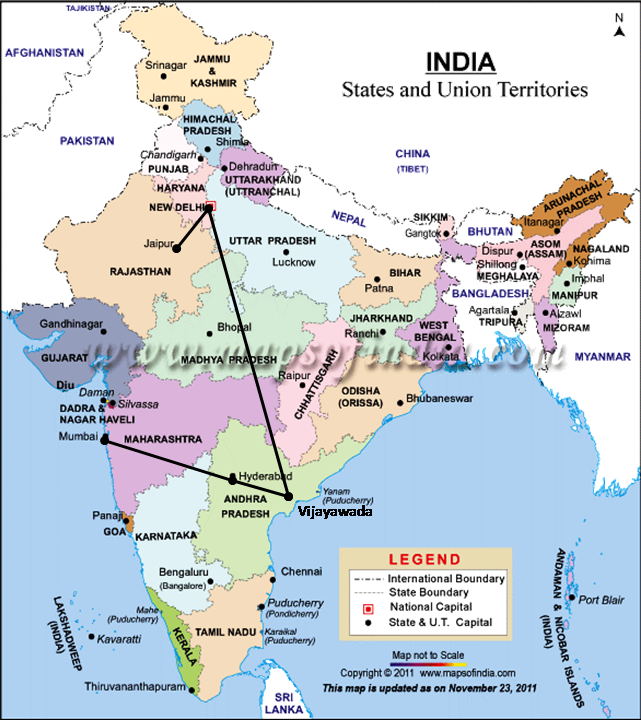 Kerala is an Indian state located in the Southwest region of the country. 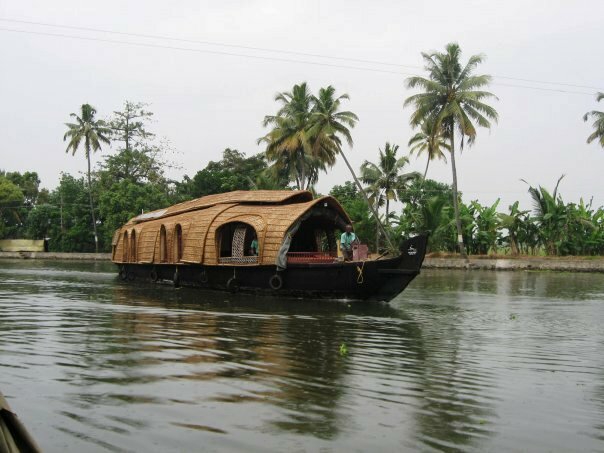 It is a popular tourist destination, known for its backwaters, natural beauty and Ayurveda medicines. 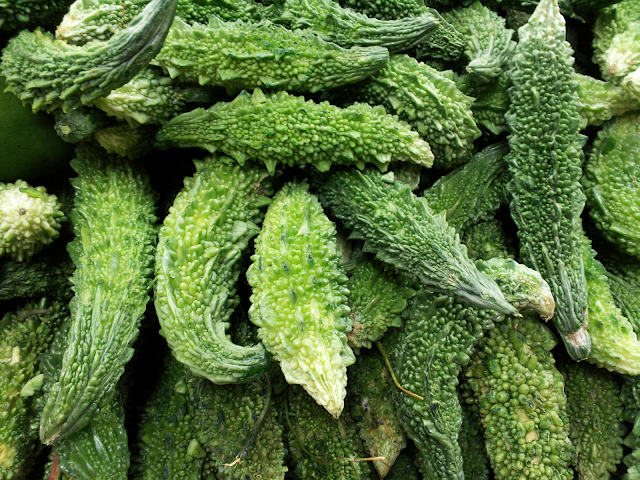 Karela, on the other hand, is a tropical vegetable that is also referred to as bitter melon or gourd. It is widely grown in Asia, Africa and the Caribbean. It can be identified by its prickly green texture and bitter taste. We love Karela and decided to share our love of this vegetable with you so you can grow to like it too. After trying a couple of tricks, we came up with one that works and reduces the bitter flavor. This recipe is called Krazy Karela because some might think we're crazy for eating it. The recipe is enough for 5-6 (2 pieces per serving). 1) Cut the ends of the karela and make a slit lengthwise. If there are any woody seeds remove them using butter knife. Cut the karela into 3” long pieces. 1) In a skillet, heat a tbsp of oil and add chopped onion. Saute the onion until its almost transparent and then add salt, chili powder, and dry coconut powder. 2) Mix it until the water is evaporated and the oil comes out. Adjust the salt and heat (chili spice) level to your taste. Allow it to cool and then mix in chopped coriander. 3) Heat oil in a frying pan until you feel the heat on your palm while its held above the oil (at a safe height, usually 4-5 inches above oil). 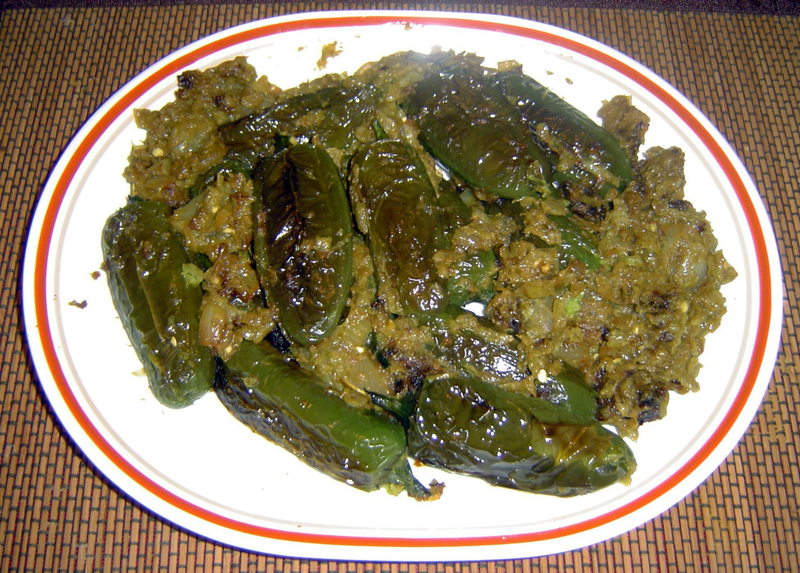 Turn the heat to medium/high and slowly drop the cooked karela into the oil and fry them to greenish brown. Remove from oil and stuff them with the onion filling. 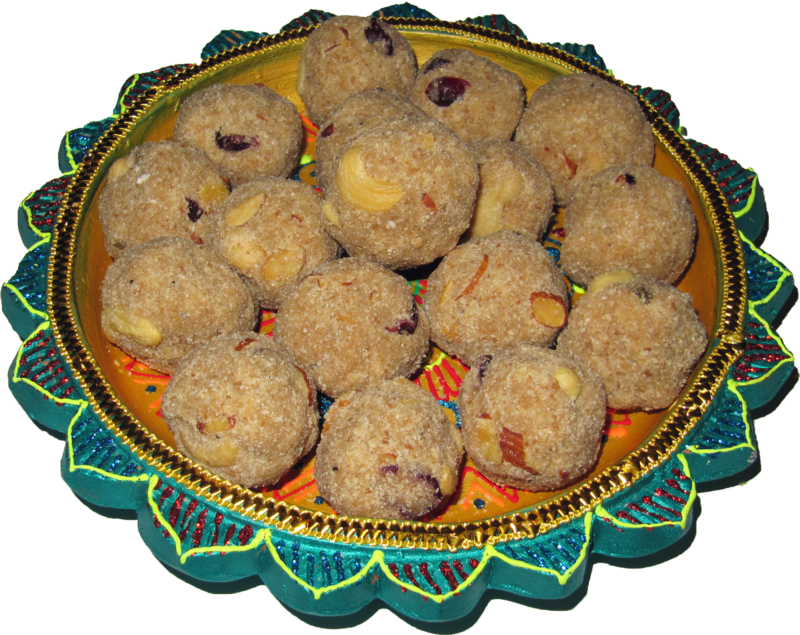 It is great as a dish on its own or can be eaten with plain or brown rice. I love eating it on its own; that way you can really taste all the flavors. 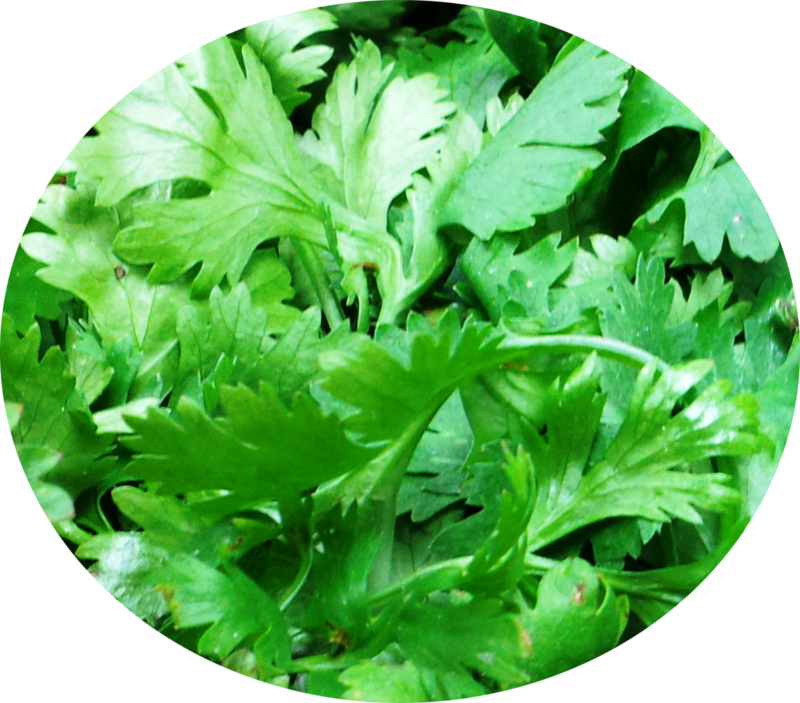 ***Quick Tip: If coriander or cilantro isn't readily available, try parsley. If you like more gravy based curries, try the Karela Curry. It's not as bitter.